The LPI® 360+ (Leadership Practices Inventory®) helps you answer this question. If you want to improve your leadership performance, you need a full understanding of your current leadership behaviors and your opportunities for growth. You need feedback from those around you. Leadership is not about personality; it’s about behavior—an observable set of skills and abilities. Over 30 years of ongoing research has uncovered that the best leaders exhibit The Five Practices of Exemplary Leadership® more frequently than their peers. How frequently you exhibit specific behaviors proven to be connected with effective leadership. Re-assessment support. A simple method to track your progress and set new goals for the road ahead. Used by more than 5 million people globally, the LPI 360+ is one of the most widely used leadership development tools available today. Let us help you on your leadership journey. 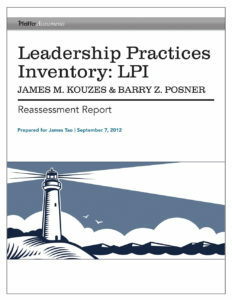 Check out the LPI Reassessment Report today.